BAHA's Greenhorn Adult Beginner League is the talk of the town. This league is designed specifically for adults who have little to no hockey or ice skating experience but want to try the sport. 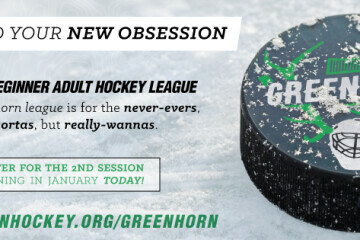 The Greenhorn league is the best and easiest way to enter into the hockey world. We welcome everyone (18+) - no experience necessary. Greenhorn players receive skills sessions to help hone abilities, and learn the game for the eventual segue-way to the HHL (Haynes Hockey League). The Winter Season runs from January 7th to March 11th. Skills sessions and games are held on Monday evenings at 8:30pm. Cost is only $150 for 10 on-ice sessions! Refer a friend to each receive $50 OFF Winter Registration fees by December 23rd. Contact Communications Director, Anna Lau at alau@bozemanhockey.org for more information.